Where is LINK System used? How Do I Monitor My Students’ Android Devices? Do You Teach In a Language Lab? If you have been involved with language labs most of your teaching career you may remember the old, rather large push-button instructor panel, the cassette recorder and huge pile of cassette tapes. Since then, technology for language classrooms certainly has advanced for the better. Applied Computer Systems, Inc. has been in business since 1971 and has the pleasure of working with schools and universities on a daily basis. Instructors find ACS to be a valuable resource for helping them implement a language lab management solution that works well with their budget and technology. ACS’s SoftLINK software runs seamlessly across your schools existing local area network (LAN). Implementation of SoftLINK in a language lab is the definition of ease. Simply install the package on the instructor and student computers and within a matter of minutes all stations are connected. SoftLINK offers language lab teachers a wealth of audio and video capabilities: share the instructor’s screen and audio to students, student audio monitoring, record student audio activity, two-way communication between instructor and student, and send announcements. SoftLINK goes beyond a typical language lab system. SoftLINK provides both visual and audio aides for the instructor. The instructor can view all student thumbnails on their screen plus there is an indicator showing if a student’s microphone or headset is active or not. Most language lab systems only provide instructors with audio features, but SoftLINK provides instructors with complete access to the students’ screens, mics/headsets, keyboards/mice, and more. Emphasize key learning points by showing the instructor’s screen to all student screens or a selected group of students. The instructor can also share their microphone or computer audio during the show. In addition, you can show a stored audio file or a video with the class and everyone can easily see and hear your presentation on their screen. Audio monitoring allows the instructor to monitor audio activity on all student workstations. The instructor is instantly alerted of any microphone or speaker/headset activity at the student’s computer. 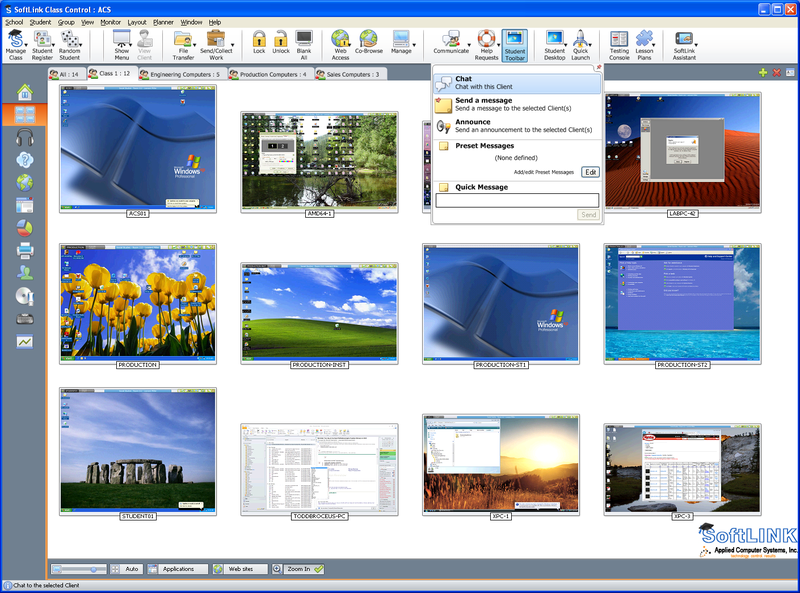 Additionally, select one of the displayed student thumbnails to listen to the audio being played on that computer. Audio activity can also be recorded and played back to students. The mic icon will flash on the student thumbnail showing there is audio activity. While listening to a student’s audio, you can record their audio and play it back later. These recordings are stored and can be accessed at the recordings link within SoftLINK. The recordings can also be shared with the students using the Show function. The instructor can adjust or mute the sound of any or all of the student workstations right from their SoftLINK console. Instructors find it advantageous to mute the students’ sound then make an announcement to the class. They will be able to hear the instructor but will not be able to speak back during the announcement. Two Way Conversation SoftLINK gives the instructor the ability not only listen to a student’s microphone, but while listening, the instructor can view the individual’s screen and remotely access their keyboard and mouse. It is a huge benefit for the instructor to have full communication and interaction with the student during a lesson and it is advantageous for the student as well. Giving the instructor direct access to the student, being able to speak with them, see their screen, and provide remote assistance when needed is provides unparalleled control and assistance in a classroom. SoftLINK’s all-in-one computer classroom management capabilities far exceed the traditional and limited ‘language lab only’ software. SoftLINK gives you more functionality for your money and can save you money by replacing other solutions that may already be in place. This is so important to schools who consistently have limited budgets. Learn more about SoftLINK language lab capabilities by visiting Applied Computer Systems, Inc. at www.acs-linksystems.com or contact sales@acs-linksystems.com for pricing or a demo. Searching for the Best Chromebook Management Software Available? Look at SoftLINK! ACS was founded in 1971, by Electrical Engineer Donald D. Lacy and is classified as a private, veteran owned, small business. The company is located fifty miles north east of Columbus, Ohio. ACS is a veteran leader in the video and audio networking industry and manufactures video and audio switching and networking equipment. Interested in the best classroom management software solution? Call us for an industry leading solution. ©2018 Applied Computer Systems, Inc.